Disclosure: This is a compensated post in collaboration with Sabra Dipping Company. As usual all opinions are my own. Thank you Sabra for making NJB possible. Sabra, you rock! The year feels like it’s quickly winding down, and soon it will be 2015. These are the moments to slow down, and cherish the season of beautiful food, holiday celebrations, and the happy people we have in our lives right? Happy people in my life like it when I make them good food. I used to rush through this time, planning Thanksgiving weeks in advance, but taking it all on my own. It drives my family crazy, because I end up way too stressed. So that last time I did that was three years ago. I was a nut case. I was in school, working at a bakery, freelance baker from home, and blogging. Not to mention I like cooking the entire meal. My family had it, they said no more, I will never do it alone ever again. I took a step back, it wasn’t that I wanted to cook all of the food to be honest. Cooking was the only thing I felt I had any control over at that time in my life. Culinary school, blogging, and working was taking a toll. I was stressed, tired, and didn’t know how else to deal but to hide in the kitchen to make an entire Thanksgiving from start to finish on my own for eleven people. I did it, worse for wear, and not worth it. Cooking and baking is what I do. I do it for a living, and for happiness. When I am stressed, I cook and bake. So it was of no surprise that I dove into that meal, blinders on, and no help needed or wanted. My take away from that, ask for help, let people in the kitchen, do more before hand. I still prep weeks in advance, but that is because it’s my favorite meal. But now I let people help me cook, and bring stuff. This year, just like years past, our family will be here enjoying the meal with us. I already made the cranberry sauce and canned it, but I will make the rest of the food a couple of days before, and leave a couple of dishes for the day of. That way we are not in the kitchen all day missing out on the family time. This year I will also be adding this delightful dish of hummus roasted root vegetable salad. I love warmed cooked hummus, it gives it a deeper savory flavor than cold and uncooked. I also love using seasonal produce, so it made sense to marinate the roots in the hummus, and roast them. It was a hit for the family and they said I could serve it for Thanksgiving as well! I ask because we are sort of a traditional meal that day kind of family. So I don’t mess with the classics, but I did add this! Note: buy beets with the tops, and use them for greens in the dish! 1. Place hummus, olive oil, vinegar, salt, and pepper in a a large bowl, whisk to combine. Save about 1/4 cup of the dressing and set aside. Place vegetables in the dressing, toss to combine using a spatula. Place vegetables on a parchment lined baking sheet. Place in oven and roast for about 30 minutes or until tender. 2. Remove from oven, place in a large serving bowl, or plate. 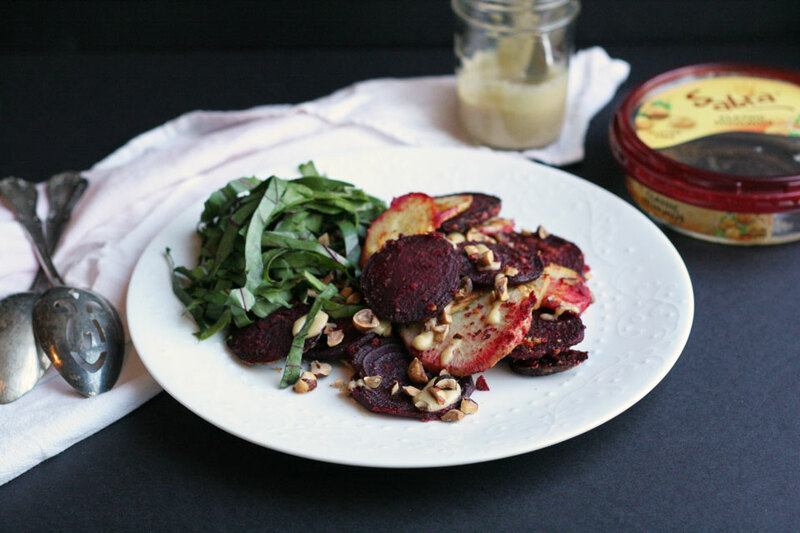 Toss vegetables with the remaining dressing, beet greens, and hazelnuts. Serve warm or at room temperature. Store leftovers in an airtight container for up to three days. 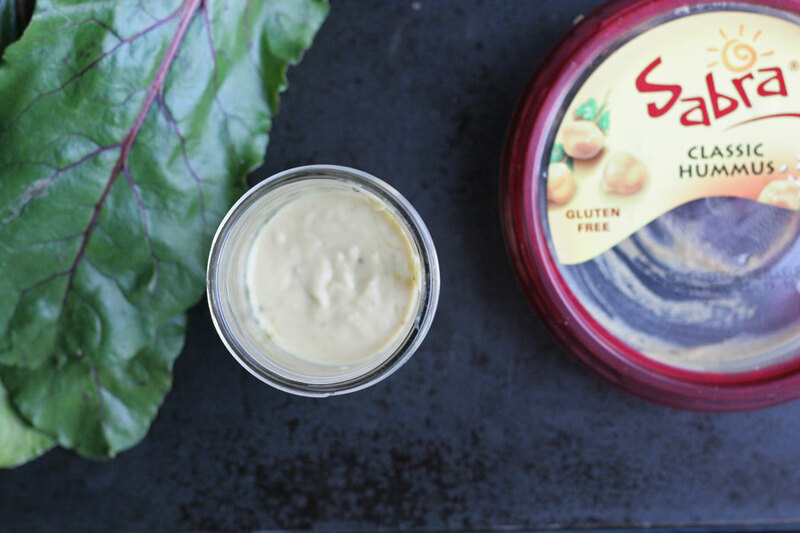 Check out some of my other Sabra hummus posts, and some of my fellow Sabra bloggers posts! Hummus Spinach Spanakopita, Cooking with Books! Grilled Fish Sandwich with Hummus Slaw, yours truly! Quinoa Hummus Wrap, Rachel Cooks! Fried Green Tomatillos, Nutmeg Nanny! What an awesome looking salad. Love using the beet greens too! Thank you so much, Gina! perfect, perfect, perfect to marinate veggies w/Sabra hummus – definitely am going to be doing this!! You are the best. Thank you! I love the idea of using hummus in a dressing or marinade like this! Such a good idea. Also, yes to beet greens! I love getting two vegetables in one, don’t you? Right! 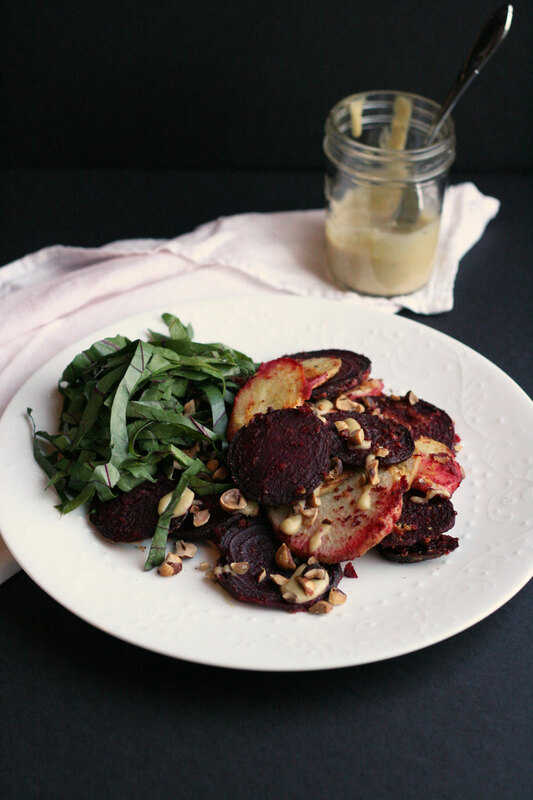 It is so easy to buy the beets with greens, so why not eat them! 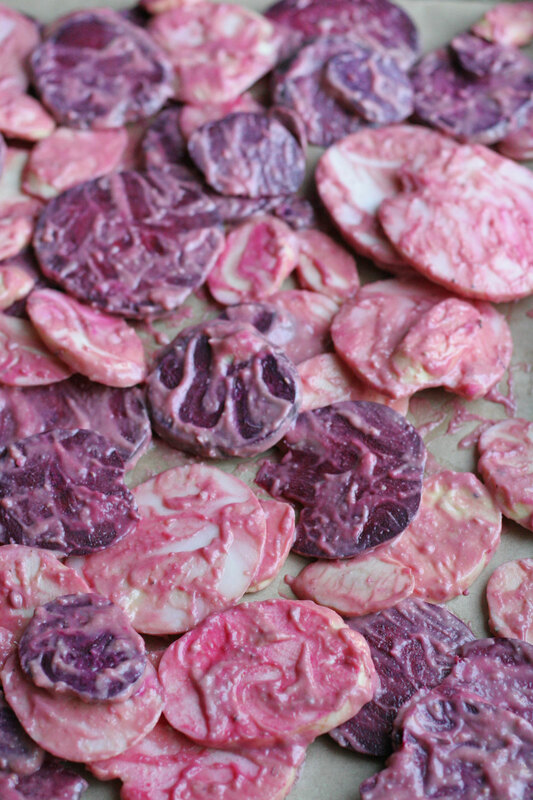 I adore the colors of this dish – love how you’ve combined so many different root vegetables! I can’t get enough roasted roots this season, and hummus simply makes everything better. This is a total keeper! Oh me too, they are the best. Thank you! I love Sabra too! Thank you! Such a delicious idea! i love the roasted veggies tossed with the hummus- yum! This is so creative and sounds so delish!! I don’t think I have ever cooked hummus. Going to remedy that with this recipe! Thanks for the inspiration to boldly go…outside the envelope. Awesome! I hope you like it Dorothy.